In Indian astrology the planet Rahu assumes great importance. Rahu is an imaginary planet and is assigned the north point of the lunar node. This is a point which is said to exert a high vibratory energy and influence on the earth. Rahu is in astrological terms said to be a beneficial as well as a malefic planets. This planet has dual qualities. These qualities assume the qualities of the particular house in the horoscope which is occupied by Rahu. Rahu also assumes great importance in traditional Indian paranormal religious practices; more particularly the Kaal Sarp Yog ritual. The worship of Rahu is prevalent in some parts of India and there are temples dedicated to Rahu. 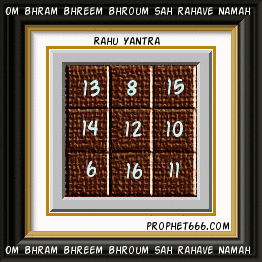 This is a Yantra representing the unique numerological value of Rahu which is worn on the body or kept in the house or office to bring in the beneficial effects of Rahu. You have given Rahu Yantra,but I could not follow that what one needs to be done.Can I just download a yantra and frame it or any certain way it needs be prepared.Can you please clarify it for me. I see that you doing great job about giving so much information which helps lot of people I do admire your work. I asked few questions but I am still waiting for the answer.please kindly respond back to me.I wanted to know about Shani yantra and Rahu yantra and do I need to draw them or print them and I wanted to know yantra or mantra for allergies you suggested and helped some one I would like to know please help me God bless you. You could draw the Yantras and keep them in in your purse after energizing them by offering flowers, Dhoop and Diya. For Shani Yantra on Saturday and Rahu Yantra can be prepared on any day. The prepared Yantras can be kept in your pocket of purse. For preparing both the Yantras avoid Rahu Kalaam. Can you please help me, I am really desperate. I need some help can you tell me some Mantra or Yantra for burkat in my home. Is this Rahu Yantra beneficial for Rahu Mahadasha amd pls tell with which ink it should be made and on white paper is ok? Can you please tell with which ink we need to prepare the Yantra and do we have to prepare on white paper? Also is it beneficial for getting beneficial effects during Rahu Mahadasha? Do we have to prepare on white paper this Yantra and with which ink? Does it give beneficial effects from Rahu Mahadasha? Your reply above is appreciated.. This is a rare stone related to the Matsya Avatar and if you are lucky enough to have one, then it can be used for all problems, including that of Rahu.